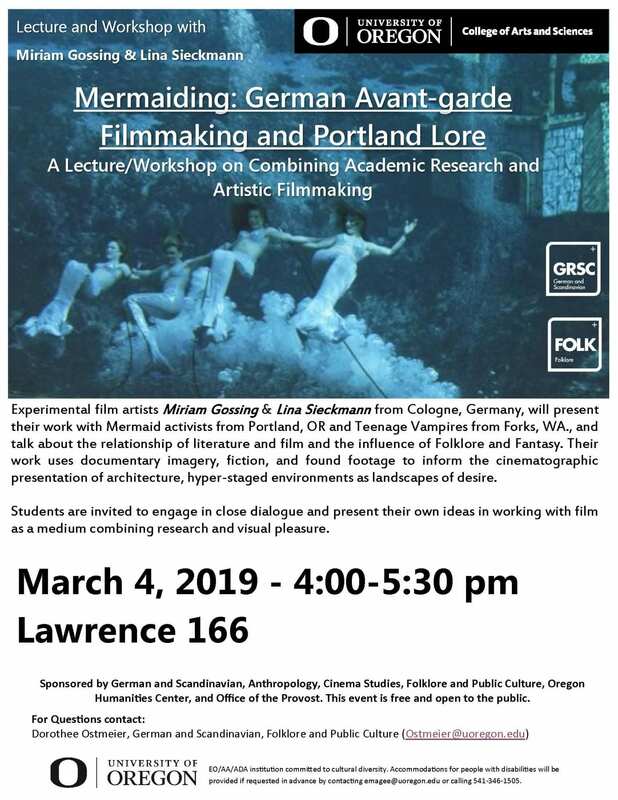 Experimental film artists Miriam Gossing & Lina Sieckmann from Cologne, Germany, will present their work with Mermaid activists from Portland, OR and Teenage Vampires from Forks, WA., and talk about the relationship of literature and film and the influence of Folklore and Fantasy. Their work uses documentary imagery, fiction, and found footage to inform the cinematographic presentation of architecture, hyper-staged environments as landscapes of desire. Students are invited to engage in close dialogue and present their own ideas in working with film as a medium combining research and visual pleasure. Sponsored by German and Scandinavian, Anthropology, Cinema Studies, Folklore and Public Culture, Oregon Humanities Center, and Office of the Provost. This event is free and open to the public.